I first met Rick Schneider, Founder of Isanti Spirits, at the 2017 Heartland Spirits Fest. Where Rick’s “Sunken Bobber” Bourbon took home a silver medal. During the event Rick told me about his distillery in Isanti Minnesota. He essentially runs the distillery himself, a one man show. 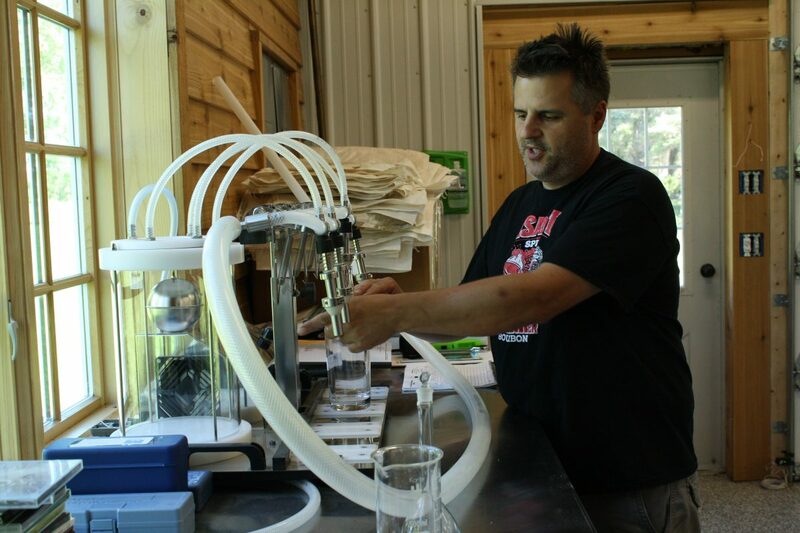 Rick grows the botanicals used to make his gin in his front yard, prints his own branded t-shirts in his basement, and his wife, Nikki, and friend, Justin Kamerer, even designed the graphic art for his bottles. 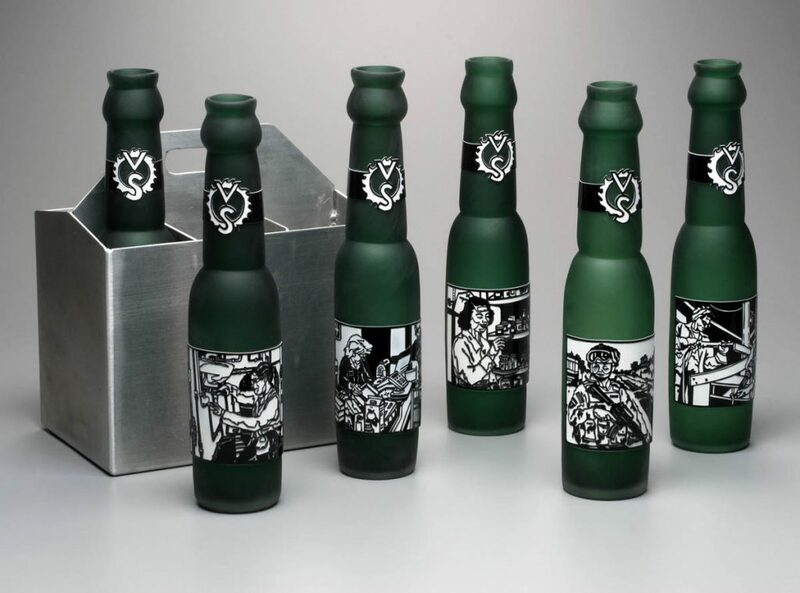 (Justin also designs posters for the Foo Fighters, Pearl Jam, and others. You can see more of his work here!) These unique aspects of his distillery left me wanting to learn more from Rick. Later in 2017, when his spirits reached the Chicago market, we reconnected. The pole barn Rick renovated for his distillery. 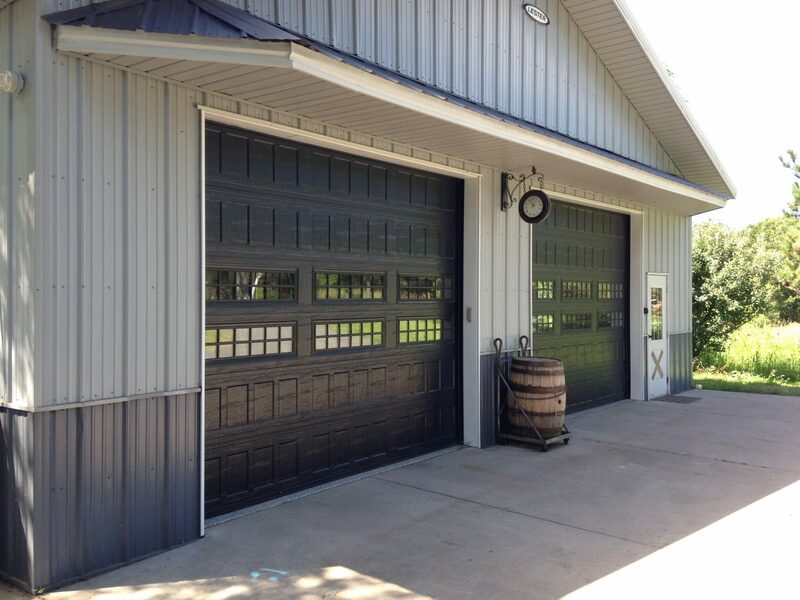 Rick lives in Minnesota, in fact he lives on the distillery property, an old farm that he converted. You could say that he lives his brand more than most. 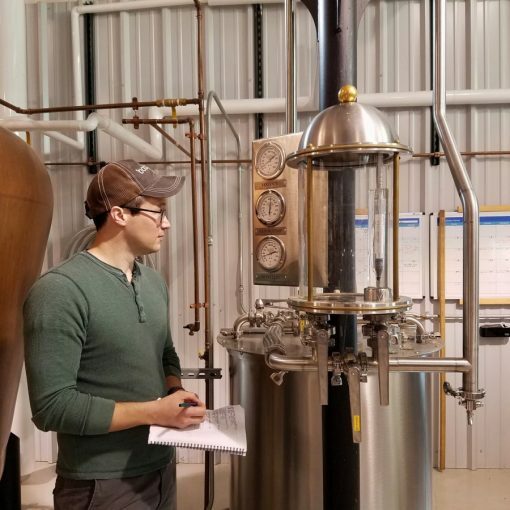 Over the years he’s had many creative passions including glass blowing, which he turned into a career as a college art professor, music, he’s a punk rocker at heart, home brewing, and now distilling. Rick tells me he’s still a full-time art professor teaching glass blowing Monday through Wednesday, then distilling Thursday to Sunday. Blown glass art created by Rick and his wife Nikki. I asked Rick how he came to be a distiller and this is what he had to say. “Every once in a while I would have a great glass of whiskey and think ‘man I wish I knew how to make this stuff!’. I was sitting in front of my computer with a glass of Maker’s Mark winter 2010 and started reading whiskey making forums. I found Dry Fly Distilling in Spokane, WA, which everyone was talking about at the time. I called up the owner Don Poffenroth and talked to him for an entire afternoon.” Rick got serious about his research and planning in 2011. 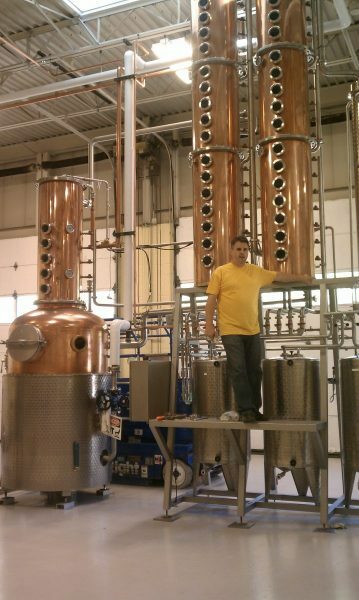 That fall he quit his teaching job and began working on his distillery plans. In the spring of 2012 he went to Washington for an immersive week-long one-on-one class at Dry Fly. After that he called up Prof. Kris Berglund head of Michigan State University’s Artisan Distilling Program. (I bet you wish you’d picked that major.) 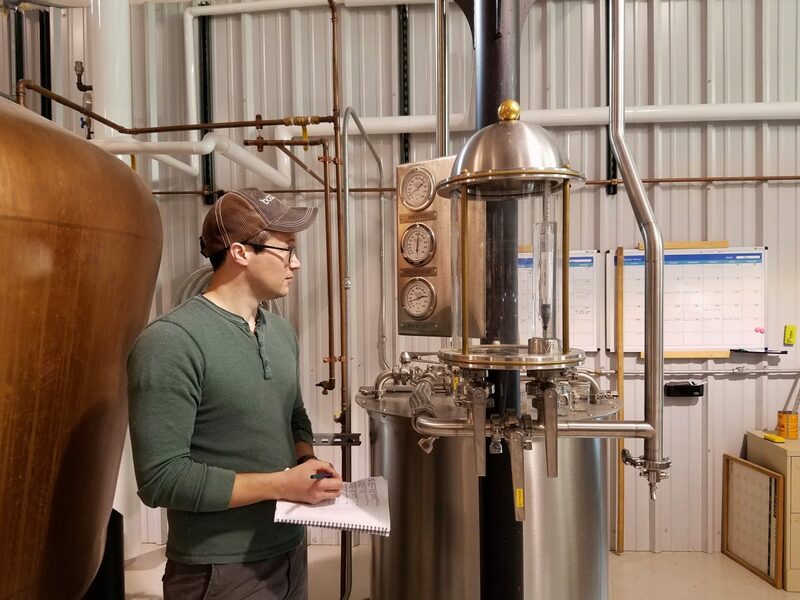 Rick packed his bags and spent the next 2 months in Michigan learning from Kris, who he calls the “godfather” of the American craft whiskey industry. Rick Schneider standing with the Carl still at Michigan State University. From there Rick found some property just outside of Isanti, MN and moved his family back to his home state. 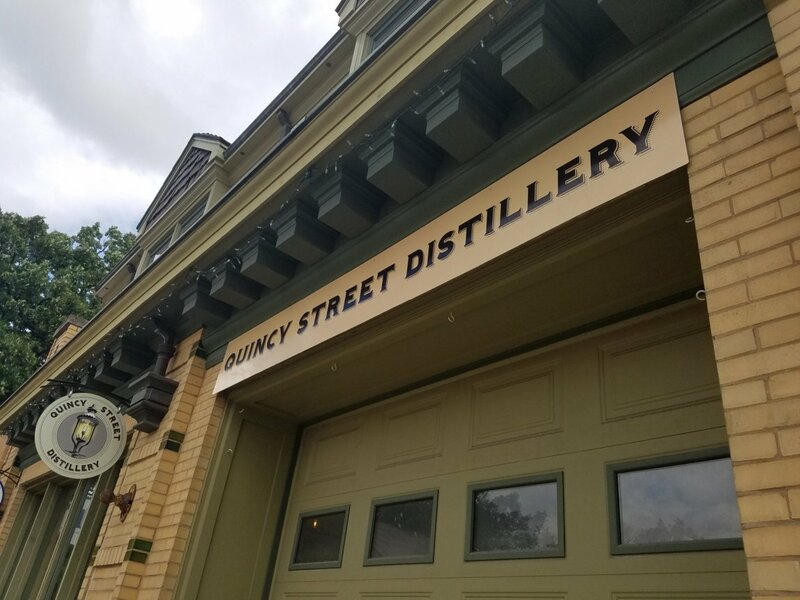 Now in its fourth year the distillery produces the equivalent of about one 53 gallon barrel each week. His goal with the brand is to make small quantities of great whiskey. Not to take over the whiskey market. 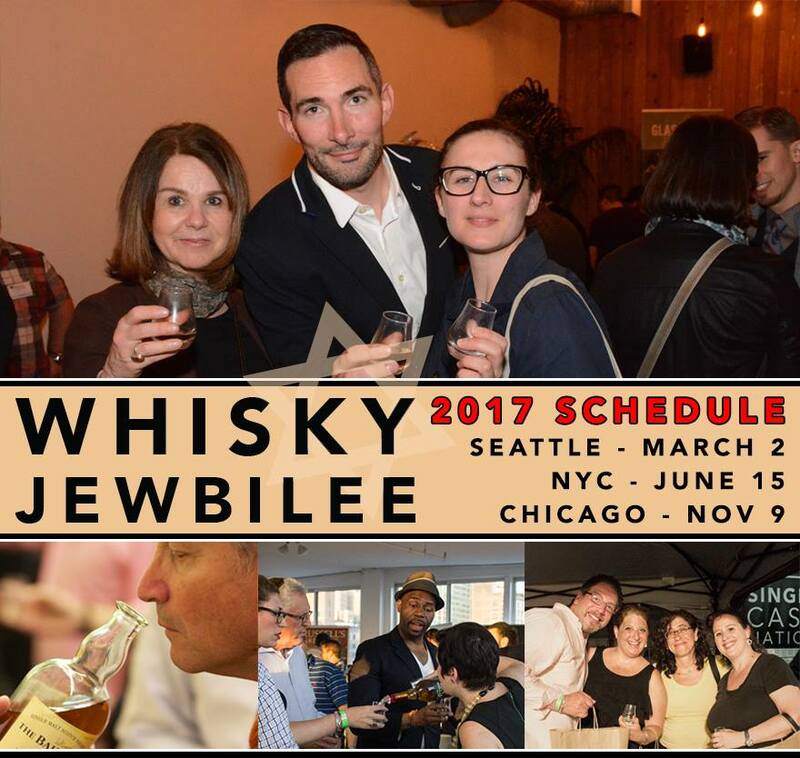 At the 2017 Chicago event I sampled his bourbon at about 1-year-old. His two and a half-year old bourbon, aged in 30 gallon barrels, is about to hit shelves followed by a 4-year-old release next summer. Rick tells me he’d like to add a brandy to his lineup as a long-term goal, maybe an Irish style whiskey as well. But now his focus is bourbon and rye. Rick gets all of his grain from a local farmer just 15 miles away. A close relationship allows Rick to choose the grain varietals that the farmer grows for him. Rick showing off his bottle filling gizmo. Now available at Binny’s you’ll be able to find Isanti Gin, Bourbon, and Rye Whiskey. 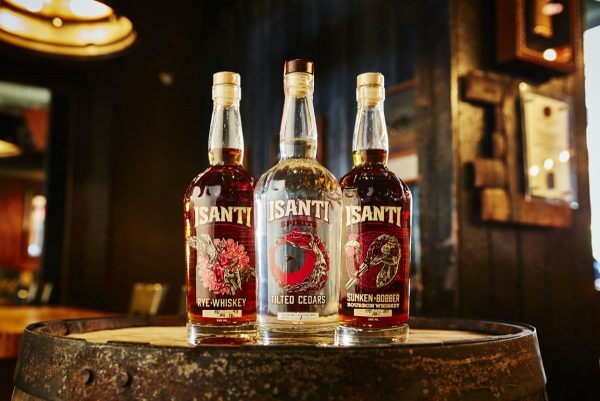 Priced at $24 to $35 for a 750ml bottle Isanti Spirits don’t carry the sticker shock found on many craft spirits. Rick tells me this is by design. “I looked at what would be the most I thought my dad would spend on a bottle of whiskey. Then I worked hard to stay under $40.” Rick believes that the ultra premium model many brands chase is a lot of marketing fluff. “Benchmark is an 8-year-old whiskey for $10! There are more than palatable whiskeys out there for $10 to $20. If I can make enough that I can keep doing it and having fun that’s what’s important to me.” His two and a half-year bourbon and next years 4-year-old release will see a small price bump over his one to two-year old bottlings but not much. In line with Rick’s pricing mentality he’s just looking to cover his angels share losses as his whiskey continues to age. Isanti Spirits Rye Whiskey, Tilted Cedars Gin, and Sunken Bobber Bourbon. You can find Isanti Spirits in Minnesota, Wisconsin, and in Chicago at Binny’s.